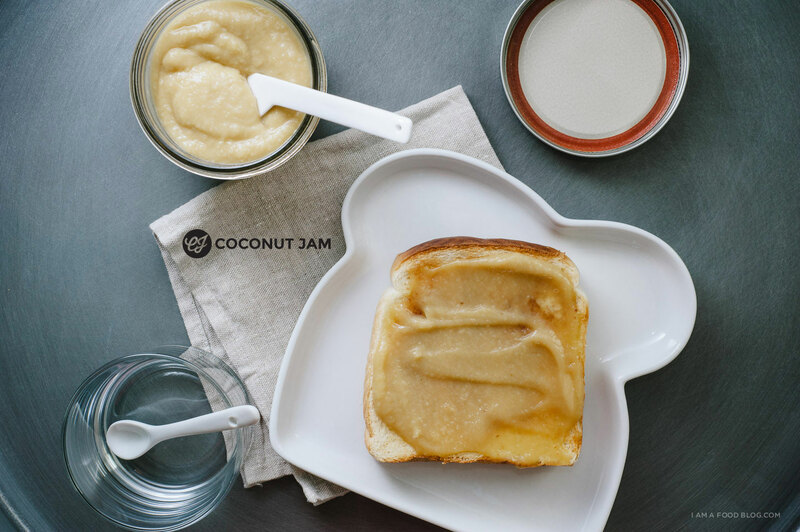 I have been wanting to make homemade kaya, or coconut jam, forever. Growing up, kaya was a staple at our weekend breakfast table. My mom would crack open a blue and yellow can of Yeo’s for me and my brother — it was the ultimate treat. Most weekends we would spread it on golden brown toast and have it alongside soft boiled eggs, but if we were lucky, my mom would make a kaya sandwich and then french toast the whole thing. My six-year-old self loved canned kaya, but once you’ve had the fresh stuff, you’ll never go back. That being said, if you haven’t had kaya before, by all means, go out and buy a can or jar from your local Asian grocery store and give it a taste to see if you like it. Kaya is a thick, dulce de leche-like coconut jam flavoured with pandan, a super common leaf used for flavouring in Southeast Asian food. It’s kind of hard to describe, but pandan isn’t so much a flavour as it is an aroma. It’s fragrant, with a slightly nutty, vanilla feel. Smelling it brings me back instantly to my childhood. My mom would make a pandan chiffon or butter cake on Sundays and we would spend the rest of the week snacking on it. In North American, pandan isn’t super common, but you can definitely find fresh leaves in Asian grocery stores. I’ve seen them sold frozen as well, so if you happen across some, pick them up and toss them in your freezer for the next time you want to experiment. Pandan doesn’t just go into sweets, it’s found in a lot of savoury dishes as well. It’s used to flavour chicken, rice, curry and more. You name it and there’s probably a pandan version of it. 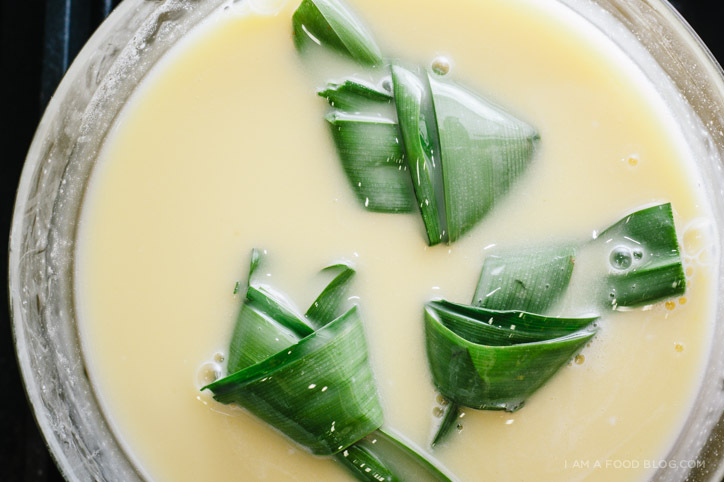 Pandan is pretty essential to kaya, especially when the recipe only calls for 4 ingredients, but you can make it without. I haven’t tried, but I have the feeling that it would be just as delicious, just not as authentic. Try stirring in a bit of vanilla if you think your jam needs it, I’m all for experimentation. And actually, after trying out this recipe I came across several more kaya recipes that I want to try, mostly because my kaya didn’t come out as smoothly as I wanted. I’m thinking it’s because of the combination of egg whites and yolks. Egg whites cook more quickly than yolks so I think eliminating the whites would result in a smoother jam. This recipe looks pretty promising. Nonetheless, my jam was thick, sweet and full of coconutty flavour. Spread on fluffy white toast and I was in kaya toast heaven. 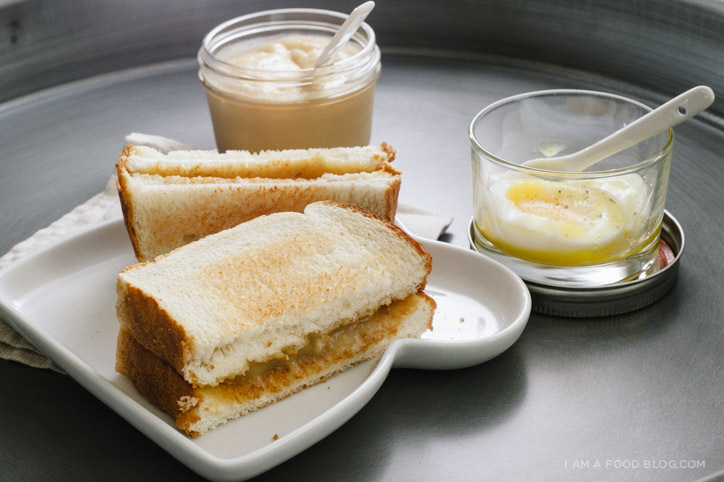 Enjoy your kaya the Singaporean way, on hot, buttered thick cut toast alongside some soft boiled eggs with soy sauce and white pepper. Dip and enjoy. Or, if you can’t be bothered to make toast, spoon it out of the jar — I won’t tell. Set up a double boiler over medium heat. 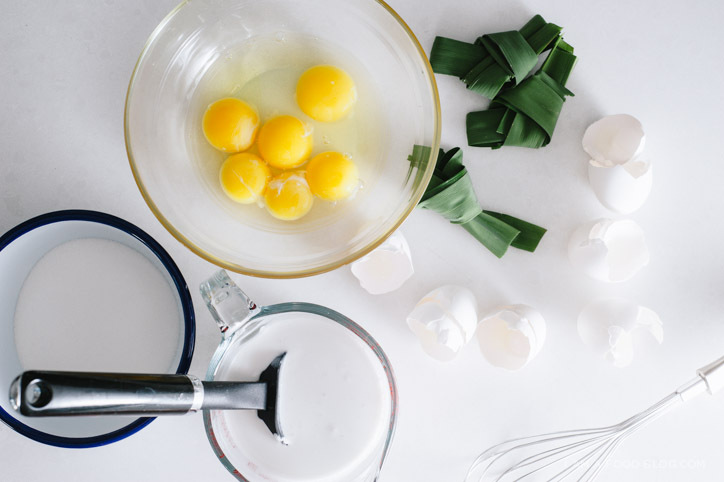 While you water is heating up, in the double boiler’s bowl, whisk together the eggs and yolks until well combined. 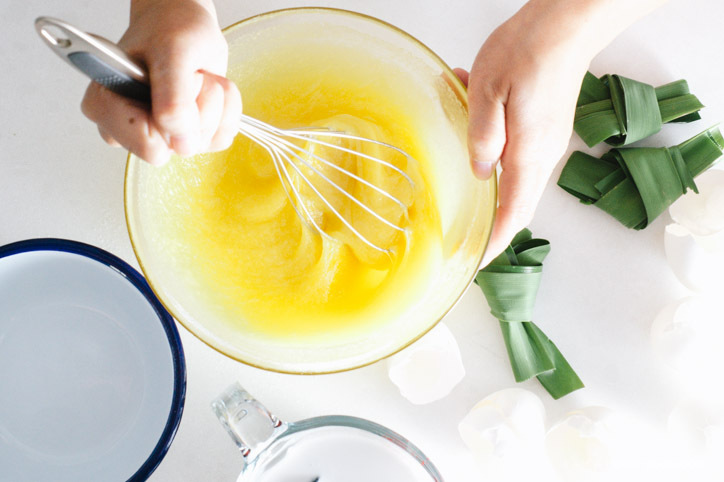 Gradually add the sugar while whisking. When homogeneous, pour in the coconut milk. Add the pandan leaves and place the bowl on the double boiler. The water should be at a gentle boil. Use a spatula to stir every 5 minutes or so. Around the 45 minute mark, the kaya will start to become thick and slightly brown. Remove the pandan leaves and continue to cook, stirring every so often until the kaya is thick and sticky. At this point, if you coat your spatula with the kaya and run your finger through it and you see a distinct, clear path, the kaya is done. If the kaya hasn’t become deeply golden brown you can help it along by adding some quick caramel. In a non-stick pan, heat up the 2 tablespoons of sugar over high heat. When melted and golden, add the tablespoon of water and stir. Add the caramel to the kaya a bit at a time until it’s golden caramel-y brown. Strain through a fine mesh strainer, cool completely and store in a dry, clean jar in the fridge. Make the toast: Your bread choice is important. Get the softest, fluffiest, thickest cut, white bread you can find. I like to use Japanese bread/shokupan when I can. Toast your bread so it has some color, no light, barely toasted pieces of bread please! Spread on a thick layer of salted butter and top with a generous amount of kaya. 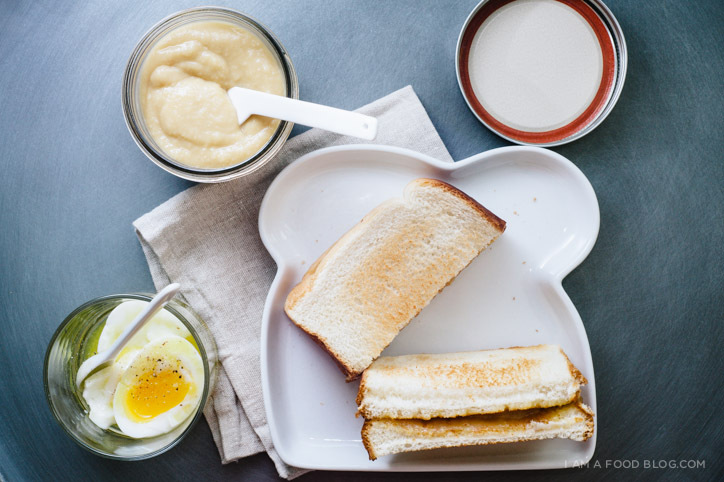 Top with another slice of buttered toast (yes, butter both slices) and dip into a soft boiled egg seasoned with dark soy and white pepper, if desired. Ooh, I almost forgot, Happy St. Patrick’s Day! For some Irish inspired recipes go here, here and here. One of my favorite breakfast treat memories from my travels in southeast Asia is kaya toast. I didn’t realize how easy kaya was to prepare! Thanks for sharing this recipe. This is such a neat recipe! I haven’t ever heard of this before. Yum! Love the sound of this! Kind of like a coconut custard? I’ve never heard of it before but this toast-and-egg breakfast looks amazing! Yes, it’s kind of like a coconut custard, but with eggs in it, so more like a coconut curd, I’d say. Toast and eggs forever and ever! Here I was looking for a good brand and you go and solve my problem for me. That’s all there is to it? Sweet! Where did you find fresh pandan leaves in Vancouver? I can only ever find frozen. I’ve gotten them from T&T before, but they aren’t there all the time. Hope that helps! Holy moliness, this looks so good! I’ve never tried it before but by the sounds of it, I would totally love it. Need to run to my Asian grocer soon!! Ohmygoodness, it is so good. The only thing that stopped me from eating it straight from the jar was knowing EXACTLY what went into it. Steph, this is so AMAZING! This reminds me of Toast Box. When I was in HK, we stayed at the Langham hotel and I would go there every morning for their kaya toast and coffee! As soon as I saw this I was reminded of the coffee shops in Kuala Lumpur, like Yut Kee. Thanks for sharing! Ooh, the coffee shops in SE Asia…sooooooo good! I’ve never even heard of Kaya and now I don’t know how I have lived so long without it. I must make it! Ah! This reminds me of my trip to Malaysia a few years ago. I took a jar of kaya home, because I found it so incredibly good. Thanks for this reminder and the recipe. Homemade would probably taste even better. Gonna try this for sure! I always bring home edible souvenirs too! I’m always sad when I run out, but so much better than a random object that gets lost in a drawer somewhere. Does it freeze well? I love kaya, grew up in indo n spore but cant seem to finish a fresh batch at once.. My abc hubbie just cannot eat it seeing a dat piece of butter i put on the toast.. I haven’t tried freezing it myself, so I’m not too sure. It should keep in the fridge for quite a while though, due to the sugar content. I know you meant to say, “My brother and I” instead of me and my brother. Yes, grammar is alive and well and it still matters! Cool recipe. Omg I LOVE kaya!! I’m probably too lazy to ever make this, but just thinking about this makes me want to run out and buy some. Thanks for sharing the recipe, this really inspired me to create my own version and few more variations. Thank you so much for the recipe! One question: what is the size of the can of coconut milk? Thank you! I’ve probably done the wrong thing and all Kaya Aficionados will hate me, but I gave it a try. A friend was visiting from Malaysia and I wanted to do the right thing. Someone told me about Coconut Jam and runny eggs for breakfast. I’d never heard of such a thing and thought it sounded as appertising as Steak Diane with strawberry jam (hmmm. Might give it a try some time.) Anyway, I managed (with difficulty here in Adelaide, South Australia) to get Kaya Spread which I presume is the same as Jam. I wasn’t sure what was meant by ‘runny eggs’ (hadn’t seen your site at the time) so I settled for Coddled Eggs. 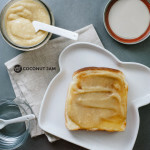 I toasted the bread, shoveled on heaps of Coconut Spread (no butter – didn’t want to over-do a good thing) and laid a couple of runny, coddled eggs on top. I DONT care I’m now addicted. Must try making my own Kaya. Come to think of it. I don’t suppose its much different from one of my earlier addictions; Avocado with Poached Eggs. PS. Note for Elle (30Mar2014) There should be a , or ; after your quote. Get a life ! Made this and it was fantastic! I wobbled around with ingredients a bit, as I only had 320 mL coconut milk — so I reduced everything by 20%, but somewhat roughly. Because of your comment about egg yolks, I added one fewer whole egg and removed a bit of white. And I haven’t got a double boiler so I fudged that as well. And then I didn’t feel like going out so I subbed in vanilla for pandan leaves as you suggested. But after all that, I’m really pleased with the result! It reminds me of a custard I ate as a child (or possibly just of the time-enhanced memory of one), probably because I keep eating it with a spoon from the jar. It’s that delicious! Thank you! A little sea salt on top of kaya toast made it really lovely. Hi, I can’t wait to try this! I love Kaya Toast whenever I’m in Singapore and it would be perfect to enjoy this at home as well :-) Thanks for sharing the recipe. What size is your “can of coconut milk”? How many ml? I guess it’s not the same amount in every country. Hi can I salvage my kaya if I overcooked it and it became too dry? You can try stirring in some more coconut milk over low heat! Kaya french toast?! Your mum was a genius. I always just had it slathered on plain bread. I know this was an ages-ago post but I just wanted to say thanks for the kaya french toast recipe. My parents just brought a jar of kaya from Singapore with them and I can’t wait to crack it open and make some kaya french toast. Sadly I’ve never seen pandan leaves in the supermarkets in my area, just frozen ones. And the frozen ones don’t quite make it. No fragrance. Mine went all scrambled eggy. Was my broiler too high? It didn’t go brown either and took forever to get thick. Stillt astes okay but the texture isn’t nice! your double broiler heat was too high, which caused the eggs to scramble. this recipe does take a long time for the mixture to thicken and brown. if you’re having problems with the color, try adding the caramel in, which will add a touch more flavor too. can you seal this in jars to keep for extended periods? 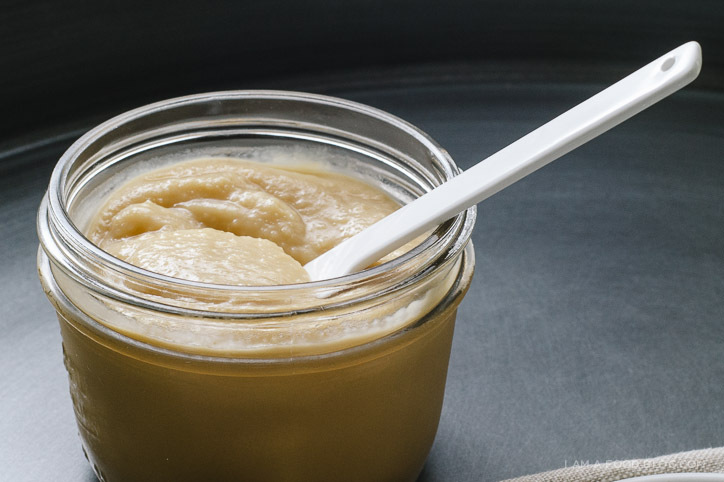 you can seal it in a jar, but you need to keep it in the fridge! Is it ok to use coconut cream instead of coconut milk? i haven’t tried with coconut cream but i think it would be too thick! Just to confirm, the ingredient – 1 3/4 plus 2 tablespoons sugar, what is the initial measurement for the sugar? And the eggs, three whole eggs, plus three egg yolks? Thanks – looking forward to making it ! it’s 1 3/4 cups plus 2 tablespoons – i’ve fixed it. as for the eggs, it’s three whole eggs plus 3 extra egg yolks. please let me know how it turns out!